The Round Rock ISD Board of Trustees approved a $1.3048 tax rate at the regular meeting Thursday night. The approved rate reflects a general operating rate of $1.04 and a $.2648 rate for debt service and remains the same as the previous year. 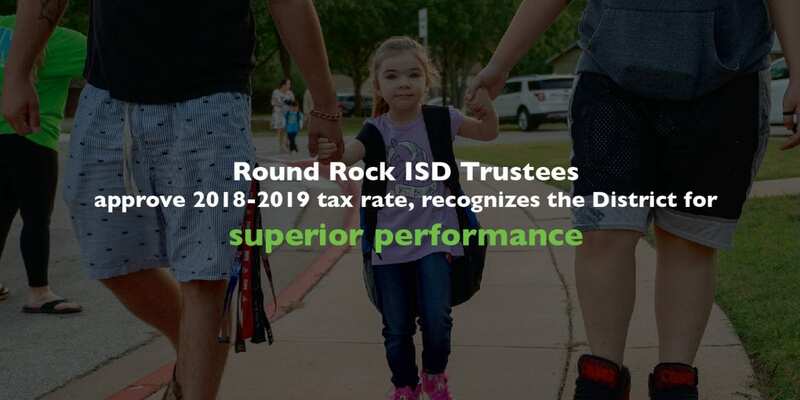 While the tax rate remains the same as last year, it will generate approximately 2.62 percent more in revenue due to increase in property values in Round Rock ISD. Trustees adopted a $445.4 million budget in June that included a 2 percent salary raise for employees. The Board of Trustees also recognized Round Rock ISD’s finance team for the District ’s recently announced Superior Rating from the Financial Integrity Rating System of Texas (FIRST). Round Rock ISD earned a perfect score in the rating system developed by the Texas Education Agency (TEA) to assess the quality of financial management. The FIRST rating system scores districts on 15 indicators in areas such as audit and governance disclosures; cash and investments; tax collections; fund balance; debt management; administrative costs; capital projects; and staff levels. The District has had a long-standing reputation for superior financial performance. It is the only school district out of 1,200 in the state of Texas to earn an AAA rating from both Fitch and Moody’s. The District has maintained an AAA bond rating from Moody since 2010 and received an AAA rating from Fitch Ratings in 2015. AAA is the highest bond rating possible which demonstrates the manner in which the District carries out its fiscal responsibilities.